I’ve complained about Japanese design before. The same gripes hold true for both software and website design. The differences between American and Japanese design can be summed up in a comparison between two directly comparable companies. 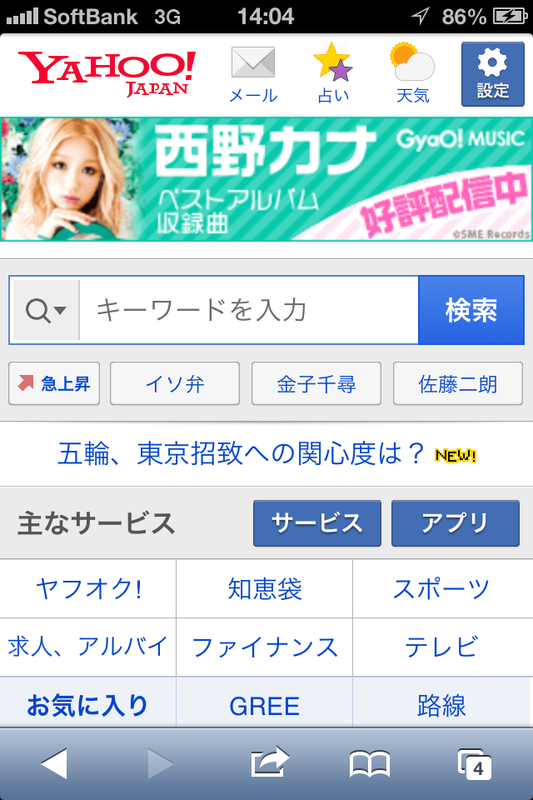 While Google may be the dominant search engine in many countries, it has not penetrated far into the Japanese market. Yahoo! Japan is still more popular than Google. While you might think that Yahoo! is Yahoo!, Yahoo! 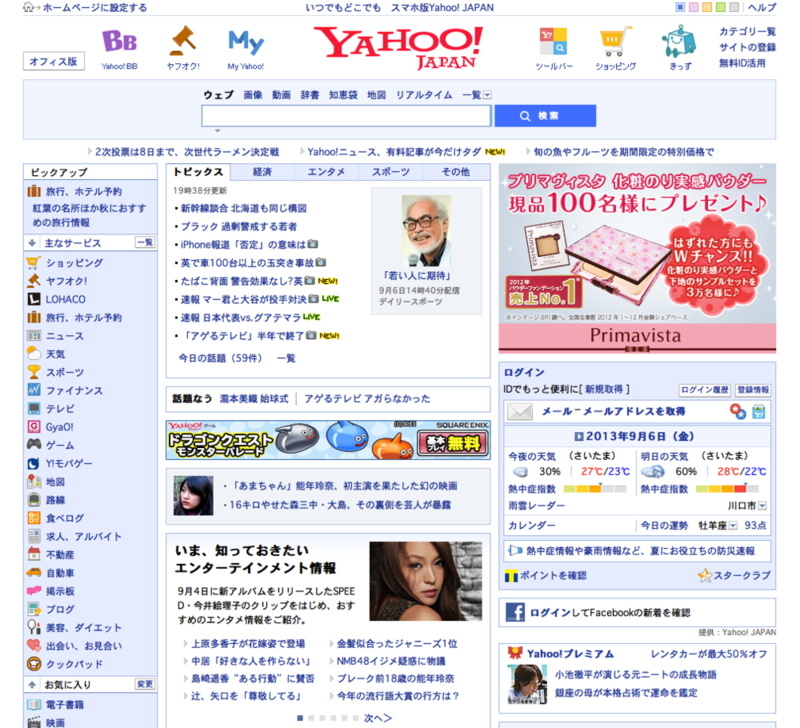 Japan and Yahoo! are vastly different, and not just because they are essentially separate companies that share a name and some common stock. 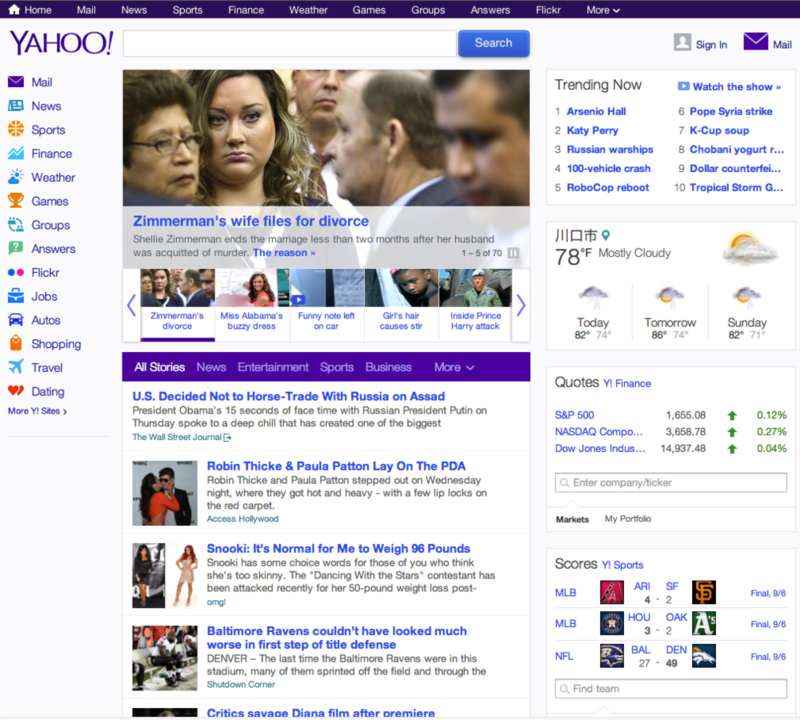 Take a look at the main pages for Yahoo! and Yahoo! Japan above. Compare and contrast with a grid-based redesign that Khoi Vinh did, in a tongue in cheek way, back in 2007. (The enlarged version has gone walkabout, but is still available on the Wayback Machine.) Looks like someone was taking notes at Yahoo!’s US office. Notice how cluttered and dense the Japanese site is. Grid layouts can be done well, but Yahoo! Japan’s site is not an example of it being done well. It looks like an amateurish private website from the early 2000s. In contrast, the US site has a much cleaner look. While it was redesigned earlier this year, even the old layout was better than the current Japan site. Here are screenshots of the mobile sites. The big ugly banner ad right across the top of the page on the Japanese site is even worse than it looks in a static screenshot — which is something of an accomplishment when the ad graphic is such low resolution. While loading, the search field is right where the ad appears. If you tap while the page is loading, it doesn’t register until after the page loads, which means the tap registers on the ad instead of in the search field. You must wait until the page fully loads before you can tap and begin typing a search term. The US site doesn’t give you an unusable target. If you tap in the search field even while it is still loading, it maintains focus. Weather and stock information are presented right below the news stories instead of buried behind a separate tab. Modern web programming is used to present the news stories as large attractive photos that are also a swipe target for advancing to the next story. A swipeable category menu below loads other news story links inline, without a full page reload. In the age of apps, websites aren’t quite as important, though. 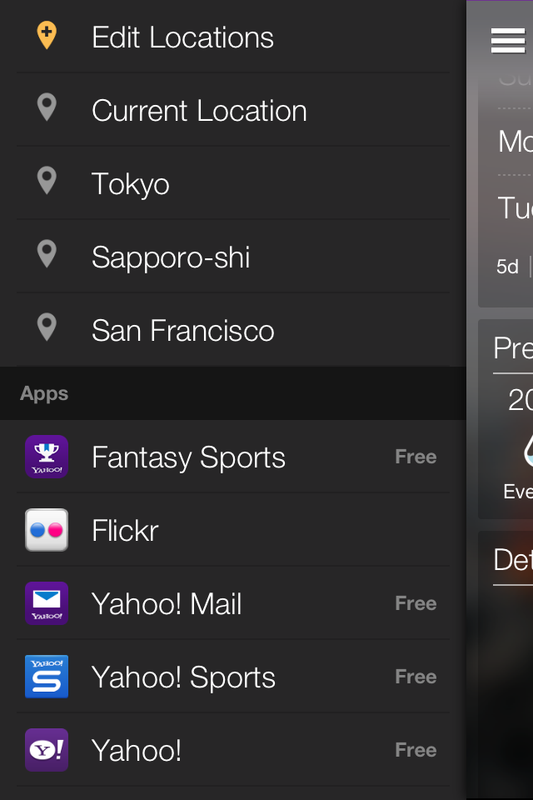 The Flickr app isn’t available in Japan (neither is Flickr itself, directly). 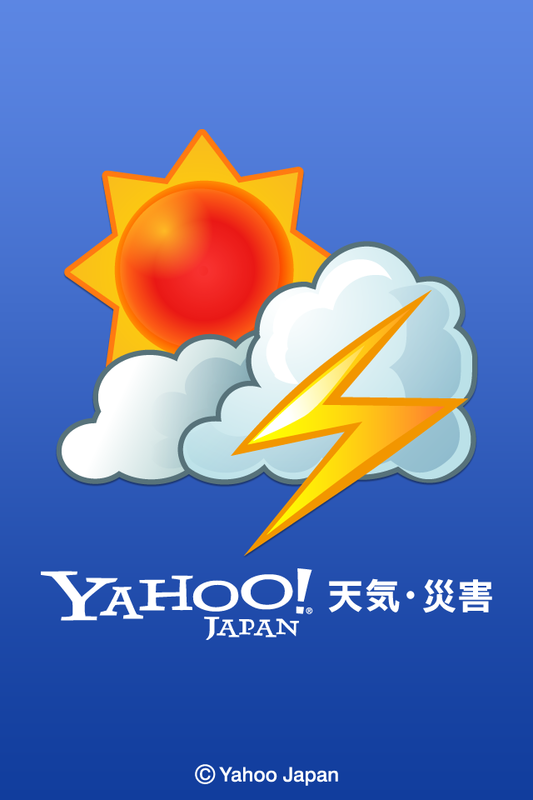 Yahoo!’s new weather app isn’t available in the Japanese iTunes store either, but there is Yahoo!天気 (tenki, weather). Immediately, when the splash screen loads, you can see a difference in design outlook. Yahoo! Japan’s is cartoony, and features an unnecessary copyright notice. Yahoo! has a simple landscape and logo. When the app fully loads, it’s apparent how radically different the design aesthetic is. Yahoo! Japan’s app was released last year, but it looks like something designed for iOS 3. Navigation is almost entirely through tapping on tabs and simple scrolling within the page view. Settings are accessed through the gear icon tab at the bottom, where there is also a completely unnecessary current location button. All of the functions in the bottom tabs could easily be consolidated in a better layout. The Yahoo! Weather app features a much more attractive design, and is, I think, more functional as well. A simple tap, or a swipe up will reveal detailed information below. Each information panel features a series of subtle dots that indicate a drag area, and the panels can be rearranged. It has a very similar aesthetic to iOS 7 beta material, with a frosted glass overlay on a pictorial background, though it was released before WWDC this year. The current location is always the leftmost pane, unless toggled off (the default is on). Other locations are accessed with a left swipe. The animation is smooth and looks subtly three dimensional. I haven’t used the iOS 7 beta, so I don’t know how the parallax and other animations feel in comparison, but the weather app’s implementation feels subtly different from swiping through your photo library. A tap on the “burger” at the top left smoothly wipes the main panel mostly off the screen and reveals the simple settings pane. Compare with the settings and information panels in the Japanese app. Even if you ignore the visual design, the user experience between these two apps couldn’t be more different. 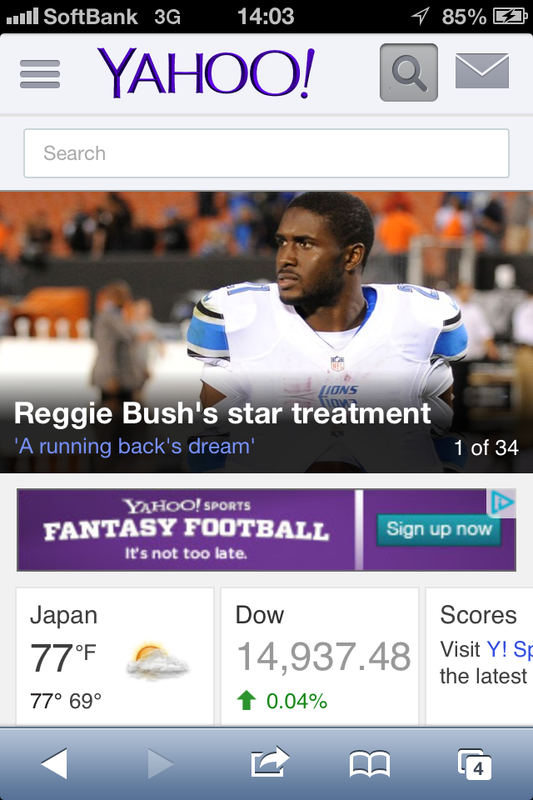 To be fair, Yahoo! has been steadily cleaning house, redesigning all of their major applications and portals. But Yahoo! Japan hasn’t seemed to take any cues at all from their parent company, and I don’t really expect to see any in the future. I used to be casual friends with a guy who worked at Yahoo! Japan until a couple of years ago, and when I mentioned once that their front page was ugly, hard to use, and cluttered with ads, he replied fairly proudly that they were more profitable than Yahoo! US. To him, that was the end of the argument. That attitude might change with the recent dramatic change in leadership but I doubt it. If you take a look at selected top Japanese sites or ones you pick yourself via a map of the Internet you can see that as a whole, most are pretty darn ugly. Fuji TV deserves special mention because apparently someone there is aware that English speakers might appreciate better design. This is true for Sony Japan and Sony US, as well, but there’s less of a discrepancy between those sites. Geek culture loves Japan, but I think that’s because curators find the very best design — most of it inspired by the minimalist aesthetics of the past. Those aesthetics are very much not in evidence in contemporary Japan. Japanese tech design in particular trails far behind most of the design work I see coming out of the tech culture in the US. That’s more than a little depressing when, for most of my youth, Japanese design was hugely influential. There is still beautiful and interesting design work being done in Japan, but very little of it is seen or appreciated here, and it seems that none of it has any influence on mainstream design.